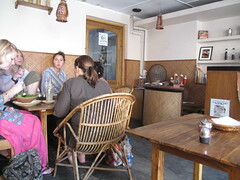 The Honey Bee Bakery & Pizzeria in Puri teems with customers when we get there. It’s fourty degrees outside, though, and the promise of strong coffee, ice-cold gazpacho, and air conditioning is too good to resist. We sit down next to three Hare Krishna devotees in urban clothes, and smile to Wynn, the beaming New Zealand lady whom we keep meeting at every meal. 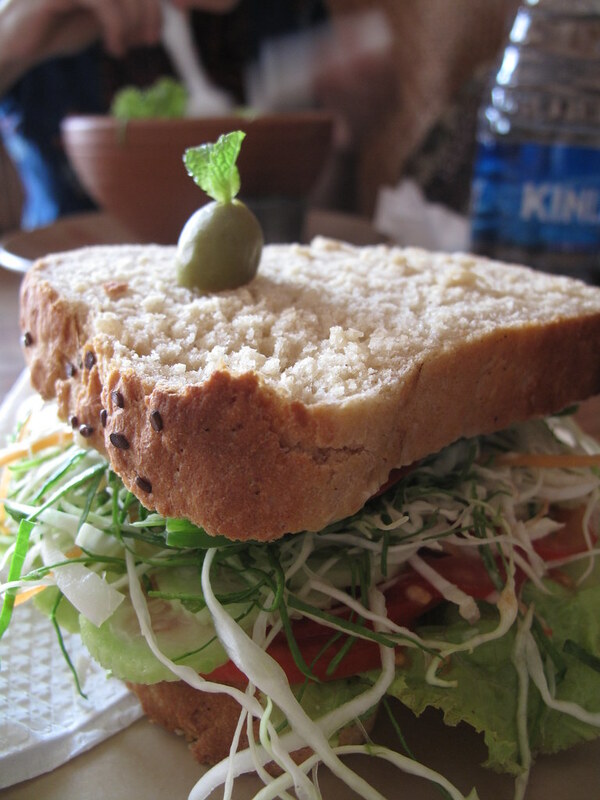 Helene spent the previous week recovering from stomach problems in Kolkata, so the first time she tried the Honey Bee’s green salad, an intense love affair was born that could only be quenched by two visits a day. When that proved insufficient we got up earlier, so she could squeeze in breakfast and lunch before the bakery closed for the afternoon. Looking around, it’s obvious it’s gonna take a while before those gazpachos and green salads reach us. You don’t go to the Honey Bee hoping for a quick meal when it’s packed like this. But none of the regulars will tell you that’s a problem. As a matter of fact, it’s something of a feature. You sit in the window, soak up the air conditioning between two power cuts, read the day’s newspaper, and watch the sacred cows and the bare-chested sadhus walk by outside. Tall and supple, with bushy, salt-and-pepper hair and beard, Debu smiles easily as he slips out of the kitchen to take our order. He moves with the slow grace of a man at peace with the world, and his eyes shine when he smiles. When he talks about food, he does so from the heart, and he grows so uncompromising yet so humble that he asks forgiveness for standing by his culinary principles. “I just cannot prepare things in advance,” says Debu. He will not accept anything short of absolute freshness in the meals he serves in his restaurant. If you order lasagna, he goes way beyond cutting the vegetables on order: he rolls the fresh pasta, too. Debu’s dedication to freshness shines the brightest in his take on the cold summer soup gazpacho: Debu brings you the soup and the final ingredients separately, so that you may mix them in your soup yourself. Next to your bowl, still cooling down with a purified water ice cube, you get a plate of chopped bell pepper, onion and bread. In other words, his gazpacho is so fresh, you finish the preparation yourself. Given Debu’s uncompromising dedication to fresh food, it’s not a surprise that Italian tourists understand him well. When he apologized to Italian visitors for the time it would take to bake their lasagna, they didn’t quite understand the problem. Their country, after all, gave birth to the Slow Food Movement, to which Debu is a natural adherent. But not everyone feels that way. We witnessed with sadness how some customers seemed oblivious to the charms of the place, and rushed through with an attitude. Given the town’s status as one of India’s four most sacred sites, you’d think the sanctity would rub off on all of its visitors. If Debu were a chef in a five-star restaurant, he might be afforded the pride and arrogance to dismiss these criticisms. But that’s not Debu’s nature, so he just shakes his head. “I cannot prepare food otherwise. I can’t accept it.” Like an artist driven by passion, he apologizes but refuses to compromise. But at the end of a long day spent in a kitchen exposed directly to the relentless heat of Puri summer, Debu is too sensitive and kind-hearted not to take bad comments pretty hard, sometimes. It’s made worse when Western tourists think they know better than this gentle Indian man who has not traveled to Europe. One time, a woman got upset when she ordered a moka, and received a stovetop Italian espresso with no trace of chocolate. She began to berate Debu for it, but Italian customers came to the rescue. Over the week Helene and I spent in Puri, we spent almost every meal at the Honey Bee. I tried to drag Helene away to other restaurants nearby, but she always pulled us back here, in the land of apple rolls and Italian coffee and green salads. 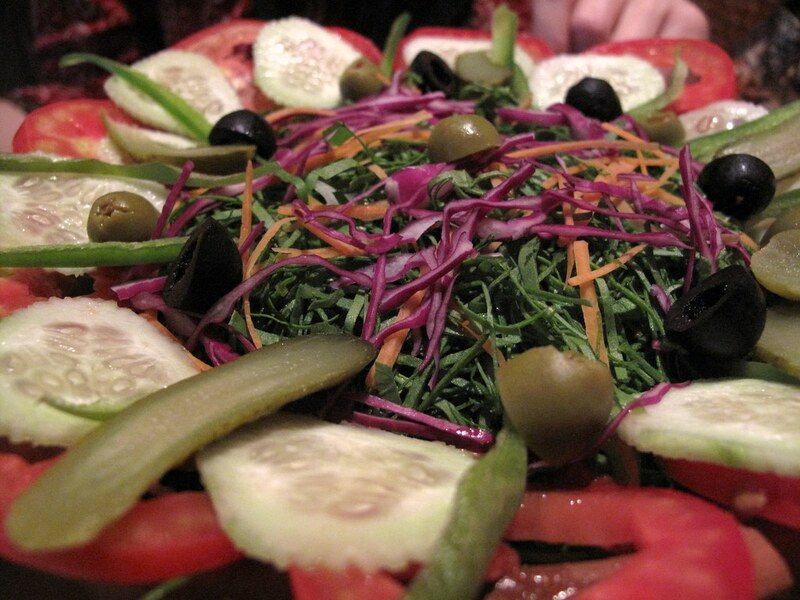 Day by day, we explored Debu’s menu, and were almost always amazed by the results. Our first surprise happened when Helene ordered a long espresso. Instead of getting an americano like anywhere else in Asia – even in Laos – Dabu nodded his head and brought Helene the real thing for the first time in six months. His coffee – floral and strong – comes from small plantations in the Indian state of Karnataka. His tomato mozzarella salad features beautiful tomatoes, fresh basil, and a deliciously soft white cheese. “It’s a bit of a cheat,” Debu explained. “It’s not really mozzarella. It’s cow cheese made at high altitude in Darjeeling.” Somehow, that just made the dish and its elegant presentation better. When I ordered scrambled eggs from the Honey Bee, I just raved about them with Debu. Scrambled eggs are a foodie obsession of mine, and I usually avoid them in restaurants because the cooks never understand how to make them fluffy and a bit humid. Not Debu: he nails it perfectly. The green salad, Helene’s favorite dish, comes in a baked clay pot, and features either lettuce or spinach, depending on supply. Here, spinach and lettuce are seasonal products, and Debu brings them in from West Bengal when they’re available. 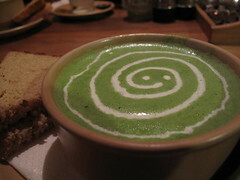 His cream of spinach, when available, is a riot of green color and taste. 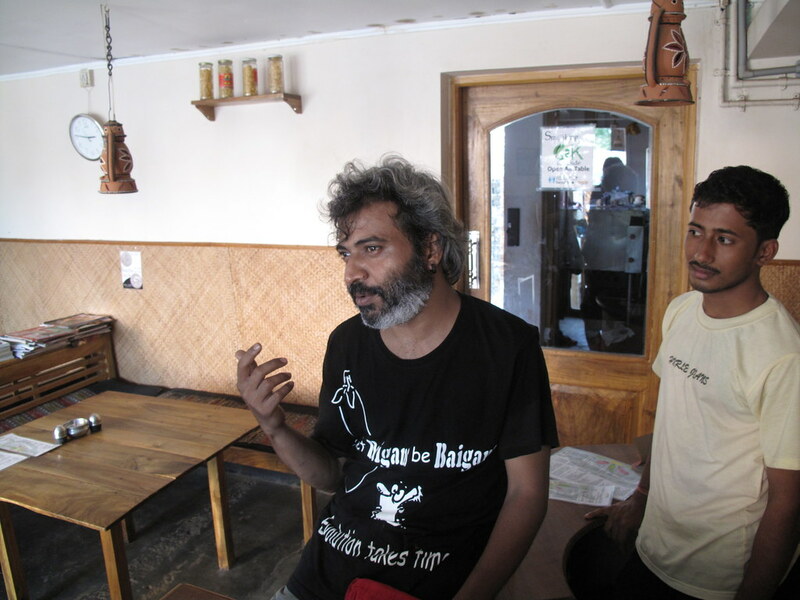 On the day we left Puri, I thanked Debu once again for the foodie haven he has created in Puri. Indian food awaited us further down the east coast of India, but Debu’s restaurant gave Helene and me a respite from the heat and the adventure, provided us a home far away from home after six months on the road, where the food was fresh and familiar and delicious. I know Debu worries about the time it takes to prepare his food. 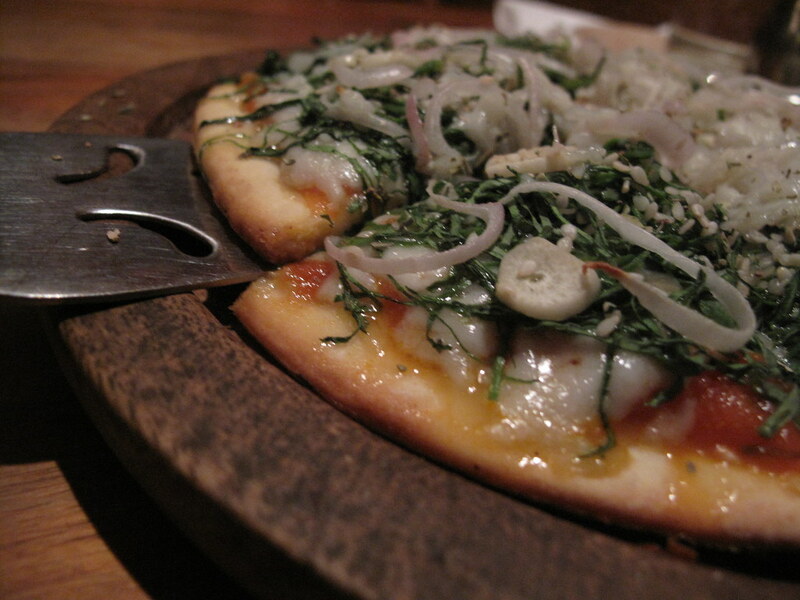 I write this blog post in the hope that he will read it, and look at it when a customer complains it takes too long to make, say, an amazing spinach pizza from scratch. I hope he just lets them walk away, freeing their spot for a soon-to-be regular like I was, who will understand the magic of the Honey Bee. Keep on taking your time, Debu! The Honey Bee Bakery & Pizzeria can be found in Puri’s Western tourist area, on Chakra Tirtha (C.T.) Road. The bakery is on the south side of the road, 200m west of Z Hotel. 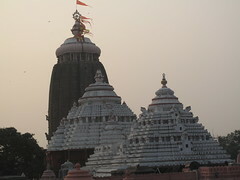 Puri, in the Indian state of Orissa, is a pleasant town, where many Western visitors spend months at a time, enjoying the slow pace, the beach and the food. 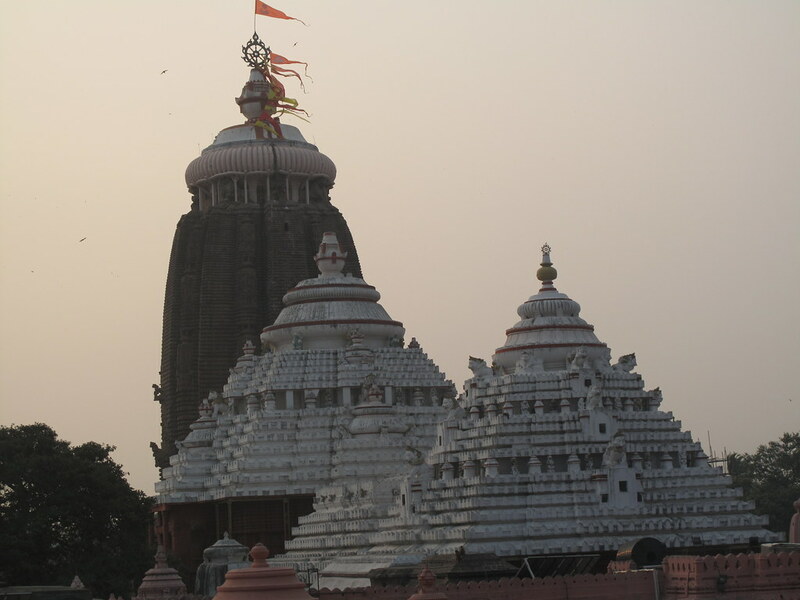 Puri is also the host of one of India’s most important pilgrimages sites, Jagannath Temple, a massive temple overflowing with human fervor and devotion a mere five minutes away by auto-rickshaw from the peace of the Honey Bee. Previous: I’m a Travel Blog Dork! Just lovely, as usual. I want to meet and embrace every person you have described, try every morsel of food and drink every liquid offered me. I know I will never get to the Honey Bee, but knowing you have, and represented such grace and gratitude for this man’s life’s work, is satisfaction enough! Fantastic post and a really amazing site. Hail Debu! 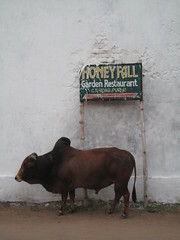 First place I am going to visit when I go to Puri is Honey Bee. Debu is great. Wonderful. A fantastic place. I’m always SO happy when I read that my recommendations have led to a cool encounter. I’m really glad you enjoyed Debu. We’re moving to India in October, and I hope I get to go through Puri again so I can enjoy Debu’s company and food one more time. I recently visited Puri and just loved the Honey Bee pizzeria. We would have two meals a day. The long wait for the food to arrive is worth it. After all, we were in the city to relax and not rush for anything. The quality of food was excellent and reflects the passion that Debu had for preparing food for his customers! It was absolutely brilliant!